ARK is pleased to offer NuFit lift and turn tub closures by Watco. Nufit easily and quickly installs over previous strainer bodies, requiring only a silicone adhesive. Available in chrome or brushed nickel finishes; our attractive drain hardware is made of durable brass and can be immediately installed in most bathtubs. The lift and turn drain sleeve is installed over the existing drain collar, thus eliminating the risk of damage and extensive repairs caused by removing the strainer body. 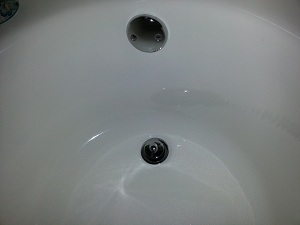 The drain is operated by simply lifting and turning to open, and reversing this procedure to close the drain. 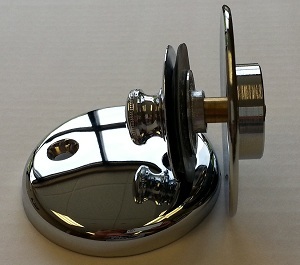 Included is a matching single or double hole overflow plate. Additional finishes are also available by special order. When repairs are necessary, if you don’t know what components are used in that tub, or what’s behind the wall, it couldtake hours – and a lot of money – to deal with the problem. With our drain hardware, there’s no expensive mystery to solve.